We welcome two new people to the Forum. Pooja Patel did a degree in Ecology at University of Derby and is now doing a Masters in Freshwater and Coastal Science at Queen Mary. She is acting as an assistant warden at Stanmore Country Park but will use her expertise at all the sites: her next task is to survey Summerhouse Lake in Bentley Priory for invertebrates. Selina Haria is helping with publicity, at present concentrating on new media: Twitter and Facebook. Publicity is important; in particular articles about the Heritage Lottery Fund grant in newspapers and Optima magazine have helped recruit new volunteers at the working parties at Stanmore Country Park. We also manned a stand on May Day at Headstone Manor, and will be at Harrow in Leaf in August. There are a number of projects and interactions proceeding that will improve our sites or are already improving them. At Stanmore Common we are implementing the Bluebell Heath project, funded by the Heritage Lottery Fund. The main work of scrub clearance will be done by the contractor T & T Earthmatters in the autumn. A number of external experts, most especially the historian Isobel Thompson, have greatly improved our knowledge about the site – for example, I did not know that the prominent mound on Herne’s Walk, that I had called “Boudicca’s Mound”, is almost certainly part of a 16th century rabbit warren. This knowledge has been integrated into a revised leaflet about Stanmore Common and Stanmore Little Common, which is at the printers now. Claire McDermott and Tiffany Moore have done a lot of work in generating a draft management plan for Newton Farm Ecology Park. The proposals are well thought out and if implemented will improve the site for humans and nature. The plan calls for increased effort from all who have helped create the Park: not only Claire and Tiffany’s loyal band of volunteers but also the Council, who are asked to mow the meadow more frequently in a bid to encourage meadow flowers and reduce the present dominance of thistle, horseradish and nettle, and even Thames Water who might, we hope, modify the flow of the Yeading Brook East to permanently flood the wet meadow. A number of the proposals have already been implemented using Green Grid money. In particular to reduce fly tipping bollards have been placed in pedestrian entrances and discreet but strong metal fences built behind the wooden ones where roads dead-end on the site. The same Green Grid initiative, driven forward by Sally Reeves and Denis Vickers at the Council, will I hope result in other improvements for our sites in the coming year, such as new picnic tables for Stanmore Common and scrub clearance in Stanmore Country Park. We should know by the end of July whether these projects have been funded. Meanwhile at All Saints’ Church James Mercer has applied to the John Lyon’s charity for funds to establish a Forest School using both the church and the adjacent Bentley Old Vicarage nature reserve. 120 disadvantaged children per year in the 4 to 11 year old age group would undergo activities such as building shelters, fire building, cooking, and learning about soils and animals. While the plans for the Ecology Education centre languish in limbo (although Councillor Keith Ferry is working hard to drive them forward) this project will, we hope, succeed in introducing some children to wild places. Other projects show less progress. We had hoped to get cattle on to 40 Acre Field in Stanmore Country Park this coming summer. The fence around the field was repaired a while ago, but the project was stalled because we needed to supply water to the cattle trough. Then last autumn a significant length of the fence was broken by contractors during the hay cut. This has finally been repaired, but the trough remains dry - Dave Corby and his team are pushing Veolia water to reconnect their water supply. I hope that we’ll eventually have fence intact and trough working and can look around to find cattle to go on the field. Most depressing has been the proposal to sell off the Cottages enclave within Pear Wood, which took up a lot of our time from February to April. Edward Milner, an expert in both insects and trees and author of the Natural History Museum’s Trees of Britain and Ireland visited and said that Pear Wood was the best ancient wood in London, so the idea of placing a new house and garden at its heart had to be fought with all our might. Carole Lis, Claire Abbott, Simon Braidman and myself all put enormous effort into fighting the proposal with much help from others in the Forum. We received considerable and welcome support from the Harrow community and the threat is in abeyance at present, but we must remain vigilant. A larger but less damaging development proposal concerns the Royal National Orthopaedic Hospital. The present, very vague outline planning proposal allows for a considerable amount of housing to be built at both the eastern end of the site, adjacent to Brockley Hill, and the western end close to Warren Lane. We have responded to the consultation with a generally positive letter that nevertheless argues that the earlier maximum of 200 residential units should not be exceeded. We gave specific suggestions on a number of points including fruit trees on the site and the population of Southern Wood Ant. Aspect Ecology Ltd. are undertaking the ecological survey and assessment work at the site, and Phil Attewell, Claire Abbott and myself are meeting Lorraine Broaders from that company in July to talk about the ants. It was reported that work on the Forest School Project was continuing and it was being piloted this term. The bid for three years funding had been submitted to the John Lyon’s charity and a decision was now awaited. Betty reported that the AGM had been held. Work on restoring the pond has been postponed due to the drought. Jill Lewis reported that the spring flowers in the churchyard have been lovely this year. The Red Campion in particular was doing well. Simon reported on the recent Green Grid funded work on the route which included the planting of a large number of native trees and clearance work. The area around Belmont Circle had been greatly improved with good involvement from St Joseph’s School; years 3 to 5. Dave Corby reported that there was a Transport for London bid to improve the entrance to Christchurch Avenue. Negotiations were continuing regarding the problem of the Electrical Substation built across the line. A field adjoining the line was mentioned. This was Council land and in the past had been a good butterfly site. Dave Corby indicated that the first priority was the main route. Fund for £59,500 to support restoration of Furze Heath in the northeast of the site was submitted on 27th March 2012. The outcome should be heard by late June 2012. A copy of the application was circulated to members. The Dragon Finder project application would form part of a larger Heritage Lottery fund application. A cheque for £580 had been received from Waitrose (Harrow Weald) though their Community Matters scheme and a picture of Steve and Peter receiving the cheque was on the HNCF website. Peter reported that thanks to Steve the signs regarding keeping dogs on leads to protect ground-nesting birds were in place. Peter also reported that there was currently some noise disturbance due to the machinery being used for the Bentley Priory development however the vistas being opened up were generally pleasing. Project work was continuing: terraces were being extended in the marsh area and clearance of scrub around the water springs. The scrub clearance prior to the proposed hazel plantation was nearly complete. There was a Management committee meeting planned for May 9th 2012 when details of the regular annual management would be discussed. The Friends of Bentley Priory were proposing a path between compartments 3 and 5 from the Aylmer Drive entrance. Lesser whitethroats were at the site and Elizabeth reported that Swallows had returned to Lower Priory farm. The extra gate is now in place and Patrick Prendergast (Arboricultural Operations Manager) has visited. There are some safety problems with hanging wood. Bridges are now a priority and the mound of earth used as a method of entering the wood needs attention. Margaret commented on the amount of litter in and around the Copse. Dave Corby indicated that some clearance work would need to take place before the problem of litter could be tackled. The Draft Management plan for this site was partly discussed earlier. Any additional comments and suggestions regarding the plan should be sent to Claire McDermott. Students from Westminster University have used the wood and cottages for filming and a group of postgraduate students were thanked for preparing a news documentary on the proposals and this was in the last stages of editing. A group from the Woodcraft Folk had carried out work on footpaths and litter clearance in February and they would be very welcome to return. BT has removed the old telegraph poles. Only about half the bird boxes had been maintained due to other pressures. The British Legion has put a floating island in the angling lake with technology to deter poachers and the island was already being used by a moorhen. Unfortunately both Canada geese and their eggs have gone from the real island at the western corner of the lake; probably taken by poachers. A butchered deer was found and the police have taken the matter very seriously. There has been evidence of shooting on the site. Lots of grass snakes were seen before the current wet period. Claire reported that she had used one metre by half to two thirds metre sections for mats cut from a roll of roofing felt and this had proved successful. Another ant nest has been translocated and a flying ant day was observed. 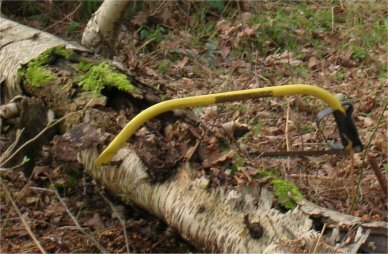 Edward Milner was stetting pitfall taps in the reserve primarily for beetles and spiders. Claire and Rosemary have led 3 guided walks around the site as a thank you for the support shown by groups such as Harrow Natural History Society, Harrow Agenda 21 and the Stanmore Society. A Fungus Foray was planned for the autumn. Bird records were being collected with members of the RSPB. Liaison with English Heritage regarding maintenance of the Dyke was continuing. Steve agreed to assist with the Japanese Knotweed problem which was getting worse. Claire also reported that 2 visits to Grimsdyke had taken place and Great Crested Newt eggs have been found, The joint venture between Froglife, Harrow Council and the Hotel has proved successful and 4 more visits are planned. A cuckoo was heard at the site today and there were Woodcock in the Ten Acre Field. John Williams congratulated the Harrow Heritage Trust on the comprehensive letter that had been sent regarding development at the Royal National Orthopaedic Hospital. Dave Bolton reported that there were some problems with the material used for some resurfacing work. Dave Corby reported that the paths would be topped with a layer of crushed concrete. Work on the steps should have started today. Simon reported that clearance work has been carried out in Cerrislande (compartment 19) and partly around an old Hawthorn. Work has also been carried out along the Heathbourne in compartment 20 where a narrow channel had been cut through the willow to let in some light to the ground flora. Some of the cut material would be used as stakes to indicate areas to be cleared or retained on Bluebell Heath. An average of 4 volunteers and an assistant warden were attending working parties. It was reported that progress was being made with the Bluebell Heath project. 3 quotes for the work had now been obtained and signs would soon be up at the two entrances. David Bailey reported that group work would be carried out with the assistance of the Westminster Drug Project. The Green Grid proposals for the car park and picnic area were discussed. While Simon Braidman is happy with the idea of widening Witling Ride to the north of the car park, and providing new picnic tables, he opposes any clearance on the other sides of the car park. At least one of the old picnic tables should be retained, perhaps moved to deep in the wood, as it was home to a lot of wildlife. John Hollingdale thanked Marian and Norman Sartin for their help at the regular second Wednesday of the month working parties. Work is continuing on the reclamation of the open area in Hilly Field. The Woodcraft Folk were thanked for their clearance work around Ant City and a party from the Geocaching Association would be at the site carrying out conservation work on August 11th. Simon was thanked for leading a recent bat walk which was hampered by a north-easterly wind but the wildlife on the tree trunks had been interested, The Spring Butterfly walk had been a victim of the rain. John Williams congratulated the Forum on their entries on the BBC wildlife finder website. Dave Corby reported that the gate repair in Forty Acre field would be the next priority after Roxbourne Rough. The water supply for the Cattle trough was being investigated and had been referred to Veolia as the supply to the field had been cut off. John asked about a possible ramp at the Kerry Avenue entrance and Dave Corby agreed to look into the matter. Clearance to connect Blue Pond Field and John Hall’s Field (a map was circulated with the agenda) is proposed in the Green Grid schedule for next year, so there may be funding (for BTCV days) from that source. The Dragon Finder proposals, including creating a new open ride to connect the Gas Main Ride and Six Acre Field were submitted to Froglife on the 20th of December 2011. They will form part of a big proposal to the Heritage Lottery Fund called Dragonfinder. John has continued to carry out routine management including cutting back encroaching Blackthorn. John requested that a picnic table be put in the Six Acre field near the Denis Lane entrance as this was where the members of the public tended to congregate. It was agreed that this could be added to the Green Grid wish list. There was a problem with the proposed Brockley Hill entrance which has been put in the hands of the legal team. We would need evidence that there has been a walking route there at some time during the past twelve years. Steve reported that on the 4th April a number of members of the Forum had visited Caesar’s pond and had agreed measures to ensure that more light reached it. £700 would be provided via the Forum and £300 from local residents. The work would be carried out in October. John Dobson reported that, on surveying Spring Pond (Pump pond), he had found flora that was unique in London. The Stonewort Nitella hyaline was nutrient intolerant and was thriving because of the low nutrient content of Spring Pond.